We were awakened this morning by a sturdy jolt to our bed! Mr. Squash and I concurred that it must have been an earthquake. Sure enough, it was all over the news - 4.5 magnitude centered 14 miles NW of Seattle. This happened last summer as well - I never heard it on the news until this morning when they explained we had one just like it last summer! The previous quake, coined the Nisqually Earthquake, several years ago, was much larger and lasted longer, so I feel fortunate that this one was minor and so far there are no reports of damage anywhere. One caller into the TV station said her parrot fell off its perch! I am woefully without anything quilting these days due to all of our preparations to get the house ready to sell! 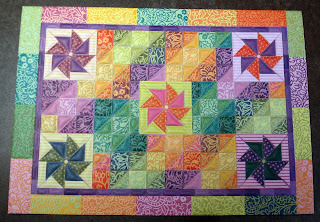 I did receive this great birthday card from my friend, Mary, yesterday - I love the colors and what a great design - I see a scrap quilt coming from this someday, so I'm going to save it! Thanks so much, Mary! Mr. Squash and I were going over what to do this weekend. Bless his heart, he said he hoped I would include some quilting! The answer to that is YES! If you have time, please check out Anne's great post on wool applique over at Cottons 'n Wool! Also, Anita over at Bloomin' Workshop has another terrific tutorial on the Medallion Quilt Along - even if you aren't making it, she has some great techniques to share! Originally from Southern California you never get used to an earthquake. Believe it or now we have them rarely in Ohio! Beautiful card and I hope you manage some sewing time soon. I have experienced earthquakes when I used to live in California. I even felt one in Florida several years ago. A little scary. Glad to know the 'jolt' wasn't a damaging one . . . those earthquakes can really turn into a mess. yikes! scary! i was awakened that happened in the midwest a few months ago. definitely a freaky feeling. We never felt it here in Aberdeen, but coming from a place where the San Andres fault ran right through our property as a child, I got used to them. Unnerving! I know you are moving, but stop by my blog and join my February giveaway. The Dogwoods Are In Bloom! A Pause in the Action! What Difference A Border Makes! Out With The Old -- In With The New!